Vintage watches tend to be on the small size - especially by todays standards. Watches from the 1940's were especially small. Ladies watches are even smaller and the majority of Hamilton's extensive ladies line-up are tiny cocktail watches. Anyway - it wasn't until the mid-1950's until men's models started to include models that were a little larger. A nice example of a larger Hamilton watch from the 1950's is the 1954 Parker. The 1954 Parker came in a solid 10K yellow gold case with a sterling silver dial with solid 18K gold numerals and hour markers. Behind the dial is an 8/0 sized 747 movement. A bracelet was available in 1954 but only a strap was used in 1955. 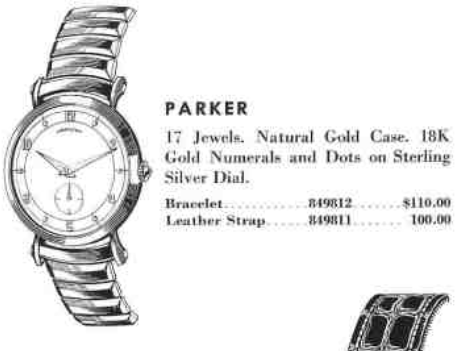 In 1956 the Parker was outfitted with the "new" 12/0 sized 22 jewel 770 movement so the model was renamed the Parker B. The Parker B is identical to the Parker - other than the movement. It continued to be produced through 1961. I recently purchased a Parker and I wasn't sure what version it was. It came on a nice vintage bracelet but it wasn't the original design. It wasn't running but I was hopeful that I could get it back in shape. Worst case would be to drop in a replacement movement. Popping the front bezel off allows the dial to be removed, along with the movement behind it. 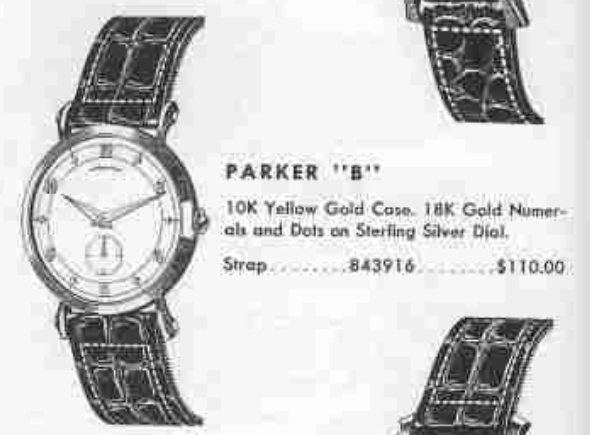 That allows me to identify the watch as a Parker B. Although the movement isn't running, the balance staff is fine so I'm hopeful just a thorough cleaning is all that is needed. There is no serial number on 770's so there's no way to narrow down whether is a 1956 model or a 1961. I really like solid gold cases because they never show any signs of the green funk called verdigris. The movement gets completely disassembled, cleaned and readied for reassembly with fresh lubrication. Now the movement is purring away like a kitten and I can put it on the timer to see how well it's running. It started off running a little fast, as you can see by the upward slope on the left side of the timer screen but a little tweaking to the regulator slowed it down to two nice, horizontal lines indicating it's keeping perfect time. A new crystal is all that was needed to restore this Parker B to "like new" condition. I like the bracelet, even though it's not original but I'll probably look for a nice genuine croc strap for it so that I don't tear up the lugs with the metal bracelet. This watch is a definite keeper, I think. Hi was this watch manufactured with a black face variant? Not according to the catalogs. If you see one I would assume that it's a custom refinish. I'm sure it would be a sharp looking watch though. There are very similar models (like the Fleetwood) that did have a black dial option but not the Parker or Parker B.
Hi, how can I find out what Parker model I have? On inside case said only Parker. If it doesn't have a 770 inside then it's a Parker.